Top U.S. officials say Pakistan is behind attacks on American forces in Afghanistan. 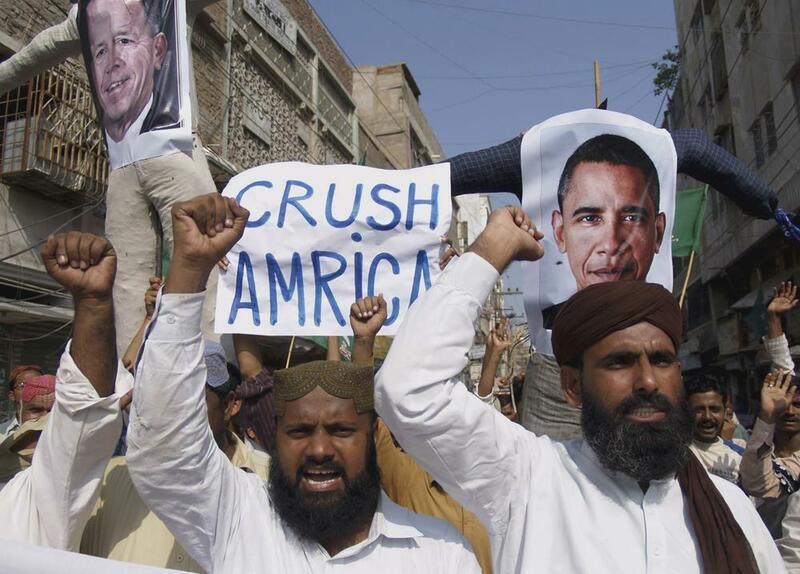 Pakistan’s a U.S. ally. What now? How bad are ties now between the United States and Pakistan? So bad that the U.S. chairman of the joint chiefs of staff, Admiral Mike Mullen, has charged that gunmen attacking Americans in Afghanistan are straight up proxies for Pakistan. A “veritable arm” of Pakistani intelligence. Raining fire down this month on the U.S. embassy in the heart of Kabul while reportedly on the phone to Pakistani intelligence. These are hot charges against an angry ally in the middle of a war zone. This hour On Point: the dramatic US blow-up with Pakistan. Are we at war with an ally? Alexander Evans, a counselor in the British diplomatic service currently on sabbatical as the Henry A. Kissinger Chair in International Relations and Foreign Policy at the Library of Congress. He previously worked at the Department of State as a senior advisor, first to Ambassador Richard Holbrooke and then to Ambassador Marc Grossman, the U.S. Special Representative for Afghanistan and Pakistan. Alissa Rubin, the New York Times bureau chief in Kabul, Afghanistan. Shuja Nawaz, a native of Pakistan, is a political and strategic analyst and writes for leading newspapers and The Huffington Post, and speaks on current topics before civic groups, at think tanks, and on radio and television. He is also the author of Crossed Swords: Pakistan, its Army, and the Wars Within. U.S.-Pakistan relations are at their lowest ebb in recent memory, with outgoing Chairman of the Joint Chiefs of Staff Mike Mullen telling Congress last week that the militant Haqqani network is a “veritable arm” of Pakistan’s intelligence service. “This is an incredibly troubled time for the U.S. Pakistan relationship,” said Alexander Evans, a veteran senior diplomat who worked for Ambassadors Richard Holbrooke and Marc Grossman, and is now affiliated with the Library of Congress. Pakistan has long walked a fine line, experts say, between support militant groups that could be used in a future conflict with India, while trying to remain close enough to Washington to continue receiving large military and civilian aid packages. In Afghanistan, said Shuja Nawaz, head of the Asia program at the Atlantic Council, the Pakistanis want U.S. troops to leave but not in a way that would lead to chaos. “They don’t want U.S. troops, but not out in a rush,” Nawaz told On Point. But there are many problems bedeviling the government in Kabul and the reconstruction effort in Afghanistan, including a domestic insurgency that has little to do with Pakistan. But, Rubin cautioned that things may not have changed all that much in one of the world’s most dangerous and unsettled regions. It may be that things have changed, or it may be that Admiral Mullen is leaving his post at the Pentagon, which might allows him to be more candid in his frustrated assessments of the situation. The New Yorker "Four weeks earlier, American commandos had flown, undetected, into Abbottabad, a military town northwest of Islamabad, and killed Osama bin Laden. The Pakistani Army, which for more than sixty years has portrayed itself as the country’s guardian and guide, was deeply embarrassed: either it had helped to hide bin Laden or it had failed to realize that he was there. Certainly it hadn’t known that the Americans were coming." RUSI Journal "After the fall of the Taliban, Pakistan’s policy of strategic depth in Afghanistan had to adapt. ‘Brand Pakistan’ has suffered over the last ten years, portrayed in the media as an obstacle to peace. Pakistan is willing to support an Afghan political process – but on the basis that any agreement is credible and reflects Pakistan’s critical role in the region. Ultimately, India, not Afghanistan, is at the heart of Pakistani strategic foreign policy, and this will continue to define the region into the future. An effective US-Pakistan bilateral relationship needs to be built on more than transactionalism." The Atlantic "Abdul Raziq and his men have received millions of dollars’ worth of U.S. training and equipment to help in the fight against the Taliban. But is our ally—long alleged to be involved in corruption and drug smuggling—also guilty of mass murder?" CBS News "The unraveling is a slow and fascinating descent. The truth lies somewhere at the bottom of a very black pool thick with the blood of American soldiers." This program aired on September 28, 2011.